The Sunboard Plus HP delivers 20 minutes of pure High Pressure luxury with a unique one of a kind, open air design for the most comfortable tanning session imaginable. 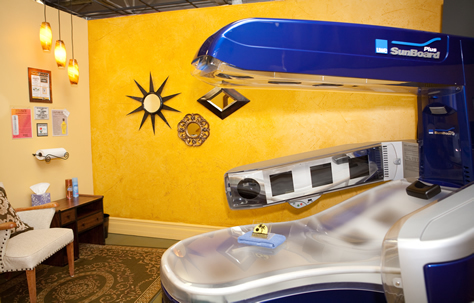 There are no moving parts that confine tanners which provides for a cooler tanning experience. This unit contains 23 of the highest quality High Pressure lamps in the tanning industry. It features ten 400 watt HP lamps on the underside of the unit and 13 1,000 watt HP lamps above and around the body for amazing, deep, dark brown color that lasts. Use the Sunboard Plus HP just 3-4 times within the first 7-10 days to build your base, followed by 3-4 visits monthly to maintain. The Ultra Classic 650 features an exclusive combination of the most advanced High Pressure and VHR Reflector lamps in the tanning industry. 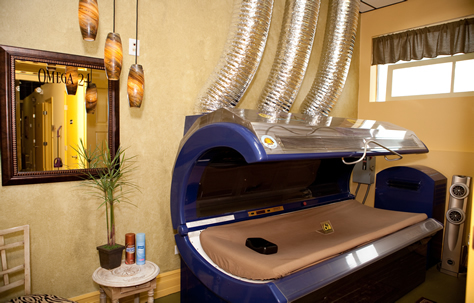 There are HP lamps over the face and a combination of HP facials and 160 Watt VHR reflector lamps over the body that deliver a unique "blending effect" of UVB and UVA induced results. This innovative technology delivers instant, deep, dark color. It is equipped with head/shoulder lamps, adjustable cooling fans, air conditioning, adjustable facials and an ergodynamic acrylic design. Build a deep base tan fast followed by 1-2 sessions weekly to maintain amazing color. With a base tan already established and using a salon quality lotion, this bed will deliver instant vacation color in just one session. The Omega HP features the strongest High Pressure lamps manufactured; 12-2000 watt HP facials. Special blue glass over each HP lamp filters out nearly all the reddening effect of UVB rays and will virtually eliminate the risk of burning. This tanning unit is ideal to build the fastest, deepest, darkest tan imaginable while eliminating any white pressure points that may occur in traditional tanning beds on one's back. 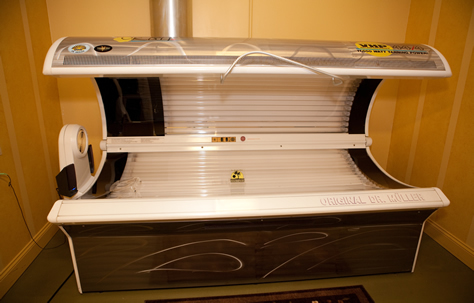 You can go zero to tan in just three sessions! Use the Omega HP only 3-4 times within 7-10 days to build a base, followed by 3-4 times a month to maintain. 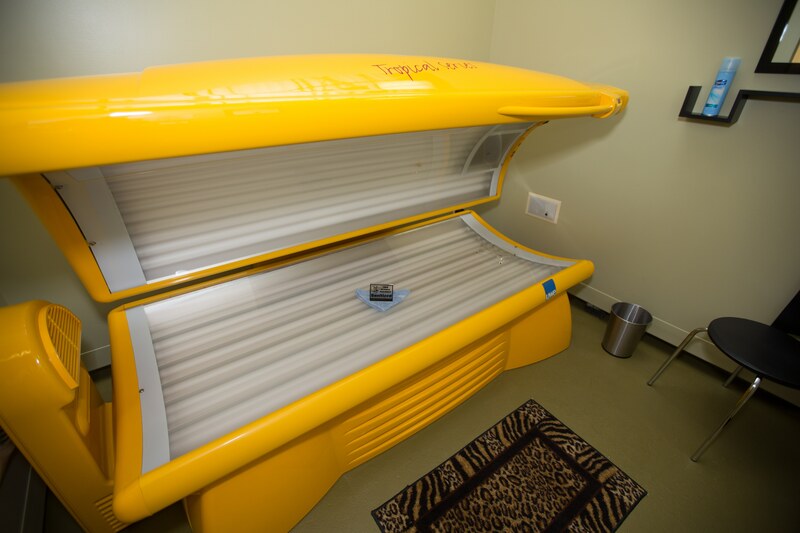 The Orbit, features an expansive tanning surface, equipped with 44 reflective VHR160 watt tanning lamps above and below tanners. Also there are four 1000 watt High Pressure facial lamps over your face that deliver an amazing amount of color in a short period of time. The special filter glass over the HP facial lamps virtually eliminate the reddening effect of UVB. Use the Orbit every 2-3 days to build a base tan, followed by 2 times weekly to maintain. The SunCapsule (Stand-Up) features 42-160 watt VHR reflector lamps. 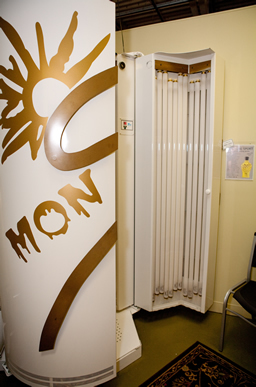 This unit is great for an even, all-over tan because it reaches hard to tan areas such as the sides of the body and underarms. use the SunCapsule every other day to build base followed by 2-3 times weekly to maintain. The Vortex (Stand-Up) features acrylic shields covering the lamps, creating a more comfortable environment. 46-160 watt VHR lamps deliver 60% more tanning power than traditional 100 watt lamps. 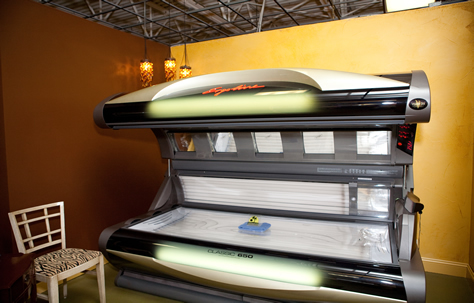 Reflectors built into each lamp also intensify the lamp's performance and allow use of less UVB to achieve your tan. Use the Vortex every other day to build your base tan, followed by 2-3 times a week to maintain. The Tropical is equipped with 2 entry level 400 watt High Pressure facial lamps. The unit also has more lamps than the Verano, thus shortening the session time. The HP facials give the face faster, deeper, darker, longer lasting color. Use the Tropical every other day to build your base tan and maintain color with 2-3 sessions weekly. 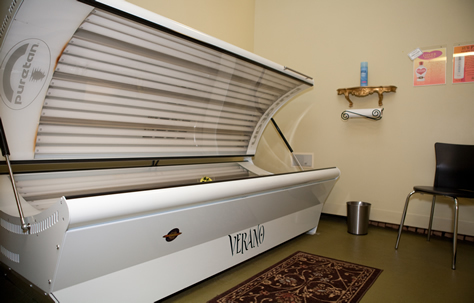 The Verano is an oversized base level tanning unit that is equipped with very low output UVB lamps which will reduce the risk of sunburn. Use the Verano every to every other day in order to build your base tan, gradually increasing exposure time as your skin can safely tolerate without burning. Maintain color in this unit with 3-4 sessions weekly. 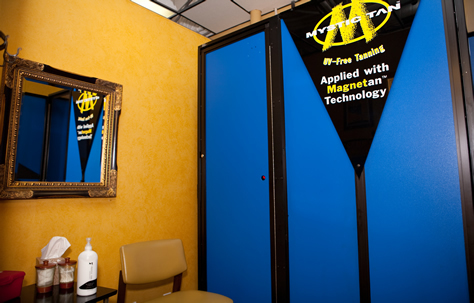 The Mystic Spray Tan is a private, self-contained unit that employs a revolutionary spray process to apply a uniform amount of Mystic Tan Tanning Myst to the entire body in just seconds. When the tanning session is complete, the tanner simply steps out of the booth, towels off any excess myst, dresses, and exits. The result is a smooth, natural-looking tan.